Part 1 of this series introduced Apache Pig™ as a scripting tool. Written in Pig Latin, Pig is translated into executable MapReduce jobs. It offers several advantages that you can learn more about in Part 1. However, some developers still prefer SQL. If you'd rather go with what you know, you can use SQL with Hadoop instead. Apache Hive™ is a distributed data warehouse that manages and organizes large amounts of data. This warehouse is built on top of the Hadoop Distributed File System (HDFS™). The Hive query language, HiveQL, is based on SQL semantics. The runtime engine converts HiveQL to MapReduce jobs that query the data. A schematized data store for housing large amounts of raw data. A SQL-like environment for executing analyses and queries on raw data in the HDFS. Integration with outside relational database management system (RDBMS) applications. Apache Flume™ is a distributed, reliable, and available service for efficiently collecting, aggregating, and moving large amounts of log data into HDFS. Flume transports large quantities of event data by using a streaming data flow architecture that's fault tolerant and failover recovery ready. Transports large amounts of event data such as network traffic, logs, and email messages. Streams data from multiple sources into HDFS. Guarantees reliable, real-time data streaming to Hadoop applications. Apache Sqoop™ is designed to efficiently transfer bulk data between Hadoop and external data stores such as relational databases and enterprise data warehouses. Sqoop works with relational databases such as Teradata Database, IBM® Netezza, Oracle® Database, MySQL™, and PostgreSQL®. Sqoop is widely used in most companies that collect or analyze big data. Depending on the database, it can automate most of the process of describing the schema for imported data. It uses the MapReduce framework to import and export data. This enables Sqoop to provide a parallel mechanism and fault tolerance. It provides connectors for all of the major RDBMS databases. It supports full and incremental loads, parallel export and import of data, and data compression. It supports Kerberos security integration. Apache Zookeeper™ is a coordination service for distributed applications that enables synchronization across a cluster. It provides a centralized repository where distributed applications can store and retrieve data. Zookeeper is an administrative Hadoop tool used to manage the jobs in a cluster. Some developers refer to this tool as a "watch guard" because any changes to data in one node are communicated to the other nodes. Apache Ambari™ is a web-based tool for provisioning, managing, and monitoring Apache Hadoop clusters. It has a very simple yet highly interactive user interface for installing tools and performing management, configuration, and monitoring tasks. Ambari provides a dashboard for viewing information on cluster health, such as heat maps. It also enables you to view your MapReduce, Pig, and Hive applications alongside features so that you can easily diagnose their performance characteristics. Master services mapping with nodes. The ability to choose the services that you want to install. Streamlined installation, monitoring, and management. Hadoop is a very effective solution for companies that want to store and analyze massive amounts of data. It's a much sought-after tool for data management in distributed systems. Because it's open source, it's freely available for companies to leverage. 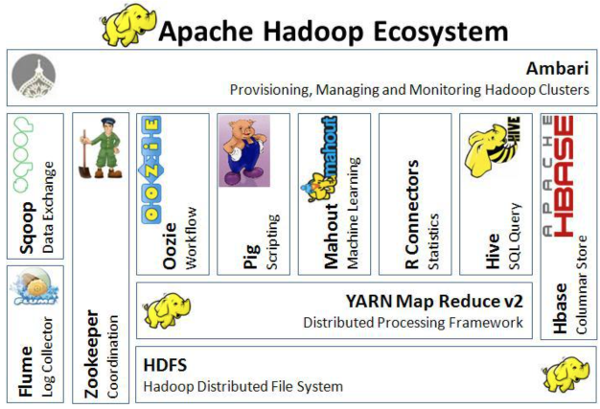 To learn more about Hadoop, see the official documentation at the Apache Software Foundation website. Have you used Hadoop? Let us know what you think by posting a comment below.